Once more Sammy Hagar enjoys the freedom to do what he wants and so he invited some friends to records some songs. It's all about having fun and so the charismatic frontman recorded some songs of his own and some cover versions. The kicks off with Winding Down, a song he recorded with Taj Mahal. Some songs are more rock-based, but all are flavored with blues or country or some Southern sounds. Quite a surprise is Personal Jesus, a song most will know from Depeche Mode, but now it became a bluesy rocker with heavy riffs and soul-like backings. While the rhythm section is Chickenfoot's sonic backbone the guitar is played by Neil Schon. Love this version! A guitar-based country rocker is Father Sun, a song written by Hagar. Once more Vic Johnson is taking care of the guitar. Parts of the song are acoustic and so it's a roller coaster ride. The single Knockdown Dragout is a heavy rocker where Kid Rock joins Hagar on the mic. Guitars are played by Vic Johnson and Sammy Hagar, but Joe Satriani plays the solo. Time for another cover version, this time it's Bob Seeger's Ramblin' Gamblin' Man. Bob Seeger had this song on his same-titled 1969 album, but the song doesn't sound backdated. Bad On Fords And Chevrolets was written by country singer / songwriters Ronnie Dunn and Ray Wylie Hubbard, so you guess it, it's a country rocker ennobled with Hagar's and Vic Johnson's guitar play. And Ronnie Dunn gives a helping hand with the vocals and joins Hagar for this one. Margaritaville is a different story, it's was a hit for Jimmy Buffett and seems not to fit to the other tunes, but on the other hand this was a fun project and so there are no rules for Sammy Hagar to stick to. Here Hagar shares vocal duties with Toby Keith. Another Hagar tune is following, All We Need Is An Island and that fits well to Margaritaville. The track has a Caribbean flavor, a very laid-back feeling. For this one Sammy Hagar invited Heart's Nancy Wilson to join him on the mic. Last but not least Going Down, a real rocker which got recorded live in the studio by Michael Anthony, Chad Smith, Neil Schon and Sammy Hagar. I think this is what most expect from The Red Rocker, but this is fun - for him and for all music lovers, too. Well, if you are open-minded. 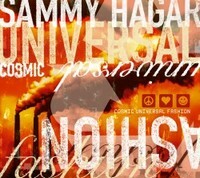 For hard rock and metal fans Sammy Hagar isn't a nobody! He started his career with Montrose and later joined Van Halen. Sammy Hagar played numerous shows and recorded several solo albums through out his 30 year career. Now the Grammy Award winner is presenting his latest album called Cosmic Universal Fashion. Even if this one won't get him another MTV Award, at least it's not very likely as the music scene changed... But Mr. Hagar is well off as he has the Cabo Wabo Cantina, the Cabo Wabo Tequila and just recently started Cabo Wabo Radio! The red rocker didn't need to worry about a budget for this album, he sold 80% of his Cabo Wabo Tequila to Campari and it's wasn't a bargain for Campari! Opening up with the title track it soon gets obvious that Sammy Hagar isn't stuck in the 80's and that he is open to new sounds. At Cosmic Universal Fashion he combines a funky groove, heavy riffs, melodic vocals - partly distorted - with rock. A modern rocker which some might not expect from someone being active for more then 3 decades! A laid back rocker with great guitars and cool vocals is Psycho Vertigo. They push again with Peephole which is heavy, grooves and has a touch of Soundgarden. One of my favorites on Cosmic Universal Fashion! Another one is Dreams / Cabo Wabo which is actually a long live version of Dreams; the acoustic version of the Van Halen tune is just amazing! Touching and real cool! Loud is a cool tune and the kind of stadium rocker you might expect from the Californian. But real fun. And I think the cover version of Fight For Your Right To Party the red rocker did for fun, coz the Beastie Boys song been covered countless times. Even if this version is more rock-based and lacks the punky edge, it's cool. And it sounds like he had a hell of a time doing this one... A slow tune is When The Sun Don't Shine which becomes a country rock song, but also has a bluesy edge. A party rocker is 24365! And probably what you expect from him, but at the end of the day it's the mix of different sounds. It's the variety which makes this album interesting and perhaps the fact that Mr. Hagar is just doing it for fun. It seem he doesn't care about what people expect from him, he just wants to have a good time. And this album is made to have a good time! This man isn't going to retire soon... He will rock til his dying day - and will surprise his fans with new sounds and blends. Sammy Hagar's passion for rock is still alive and kicking. This won't be the last time we hear from the blonde Californian!